Ownership Dover Downs Entertainment, Inc. It all started in 1986, as a multi-track facility run by a group of investors headed by Ed Gatlin. Gatlin and his business partners dealt in a no nonsense business style that allowed Memphis Motorsports Park to survive the up-and-down Memphis sports market and become the model of perserverance among Mid-South sports entities. Gatlin and his group went through some learning pains, but the group took their failures and setbacks and went to work, piece by piece, starting with what has become's the area's signature race, now known as the Pennzoil Nationals presented by AutoZone. Following the 1996 Pennzoil Nationals the Grand Prix Association of Long Beach, one of the major players in American motorsports, bought Memphis Motorsports Park from Gatlin's group. In 24 years, the organization founded by Chris Pook, has developed one of the major events in CART-FedEx Champ Car Car circuit--the Toyota Grand Prix of Long Beach. Now they have reached out to Mid-America in a big way. Memphis Motorsports Park is currently under a $2.5 million improvement plan, which has seen improvements to the track, stands and suite areas on the drag strip/road course, as well as the brand new 3/4-mile paved tri-oval which will be the sight of a NASCAR Craftsman Truck Series race, as well as the ARCA and USAC event. The new paved tri-oval also opens the door to attract other major stock car events. The purchase of Memphis Motorsports Park comes on the heels of Automotive Safety and Transportation Systems (ASTS), a subsidiary of GPALB, acquiring Gateway International Raceway in Madison, Ill., just outside St. Louis. Gateway is coming off a successful season in which it hosted a CART FedEx Champ Car circuit race, as well as a NASCAR Busch Grand National event and an NHRA Winston Drag Racing event. Memphis, Tenn. - An Alabama-based company that counts NASCAR star Dale Earnhardt Jr. among its investors has agreed to purchase Memphis Motorsports Park for $10 million from Dover Motorsports Inc. But what that ultimately means for the local venue is unclear. "I can't comment on anything beyond 2009," MMP vice president and general manager Jason Rittenberry said. "What's going to happen beyond that, I don't have the answer for that. We'll have to wait and see what happens." Gulf Coast Entertainment LLC, which previously announced plans to build a $640 million multi-use entertainment complex in Mobile, Ala., expects to close the deal by April 30. Rittenberry believes that Gulf Coast plans to petition for its own races and that only time will tell whether MMP keeps its biggest events. The 400-acre MMP complex in northeast Shelby County, founded in 1986, houses a three-quarter-mile oval, drag strip and road course. 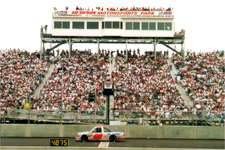 It is home to major events in the NASCAR Nationwide Series, NASCAR Camping World Truck Series and NHRA Full Throttle Drag Racing Series. As part of the deal, Dover Motorsports, which also operates tracks in Nashville, St. Louis and Dover, Del., will receive a 2-percent interest in Gulf Coast. Dover will continue to provide motorsports management service at MMP and at Alabama Motorsports Park, a Dale Earnhardt Jr. Speedway. Bill Futterer of Raleigh, N.C. based PSE-3, part of the Gulf Coast investment group, said discussions with Dover about purchasing MMP began in the spring of 2007. MMP officials do not contemplate any schedule changes in 2009 and will host its NASCAR and NHRA events as planned. While Futterer said Gulf Coast is "looking to put every sanctioning body we can possibly put into Mobile," he said that doesn't necessarily mean Memphis will lose its marquee events. Memphis, Tenn. - Dover Motorsports announced that it's closing the Memphis Motorsports Park and moving events scheduled for the track to other facilities. "This was a difficult decision for us, but one that ultimately was dictated by economics," said Denis McGlynn, president and CEO of Dover Motorsports in a prepared statement. "For all concerned, including the Memphis community, it is truly sad to see Memphis Motorsports Park taken off the racing schedule." The Memphis facility had been under an agreement of sale to Gulf Coast Entertainment but Gulf Coast was unable to secure financing. Gulf Coast had agreed to buy MMP from Dover for $10 million as part of a larger, $624 million project near Mobile. NASCAR has approved the realignment of NASCAR Camping World Truck Series and NASCAR Nationwide Series events from Memphis to tracks in the Nashville and St. Louis areas, according to a Dover press release. Ticket refunds for 2010 events will be mailed out to fans in the next few weeks. BALLPARKS © 1996-2001 by Munsey & Suppes.